Road signs could be a help outside of your vehicle too. You drive your own life as well as driving your car from Point A to Point B. If there were signs to indicate major life events, obstacles, and which decisions were best for you, life could just get a little bit easier for you. Or could it? Many roads have speed humps that are designed to force drivers to slow down. Speed humps are placed on many residential streets, parking lots, and school areas. There may be people walking and a child playing in the area, so slowing down your car is an important safety measure. 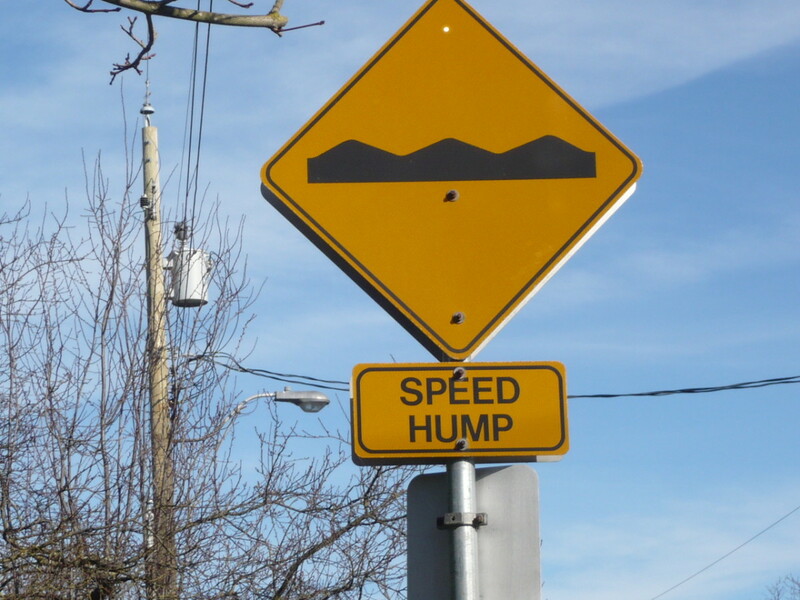 What about speed humps that exist in real life? You have the highs or great moments when you celebrate a graduation, a birthday, or a raise at work. There are lows as well. There is the lay-off from your job, the realization that your dog will have to be put down, and the day you have to go on welfare. Every life has its ups and its down. The hurdles can also be called emotional speed humps. Imagine if you could see the bright yellow speed humps road sign just before your employer calls you in to his or her office to a have a "talk" or discussion about the end of your position. 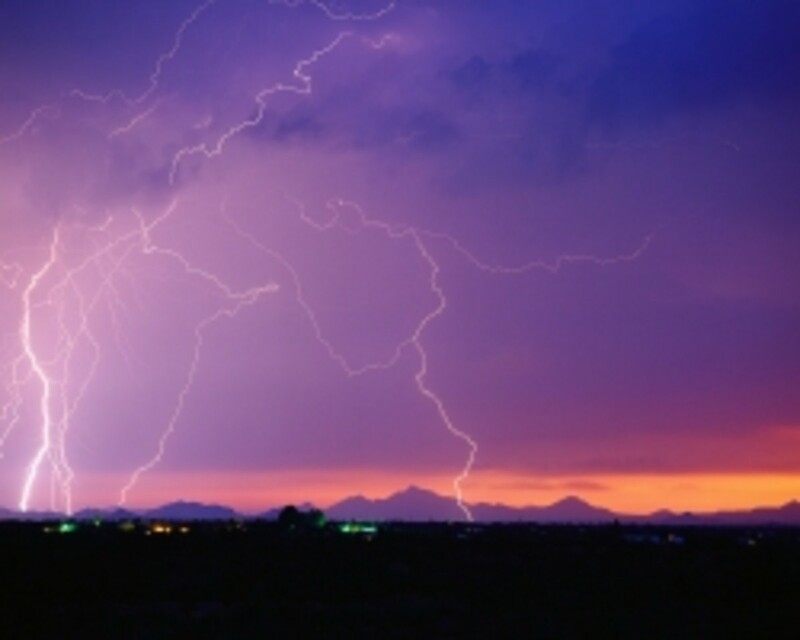 The sign would notify you that a life-changing event is going to occur; you would have time to prepare for what is to come. Perhaps you have time to write a report before the appointment with you supervisor. Imagine: the report knocks your employer's socks off, that's how good it is! Your boss nods, gives you a firm handshake, and says, "You're a valuable asset to this team." Your job is safe! You had warning to prepare for the low point ahead and avoid it. You cleared the speed hump safely, thanks to the warning provided by the sign. As you drive past a bright orange sign that begins with the word "Caution", you likely read the rest of the message as you slow down on the roadway. You respond appropriately, depending on the rest of the words on the sign. You might turn around, slow down and continue, or change lanes to avoid the drilling happening on the road ahead of you. You use common sense when you follow the guidelines of the sign. Do you have the same common sense in your real life? Some people turn a blind eye to negative situations. They choose to turn away from scenes or signs that they do not want to see. For example, a person walks past the homeless man who just asked him or her for spare change and ignores him. There is no acknowledgement of the man. If the same man was a road sign, his words might read "Caution: There is a discrepancy between the rich and poor people in your country". People who ignore warning signs in their real lives often apply the strategy that it is easier to look away than to deal with the problems directly. If the problems are ignored long enough or enough times, they will magically go away. Often, that is not what happens. The problem can become worse in the interim period. Other road signs communicate messages to drivers without any words needed. There is the Yield sign, symbolized by an inverted triangle, and there are the slanting strips on the side of another sign that tell you on which side to pass. Sometimes there is even a blinking yellow light attached to a sign to make sure it catches your attention. Take a moment to ponder if in real life you came across the sign in the photograph to the right here. 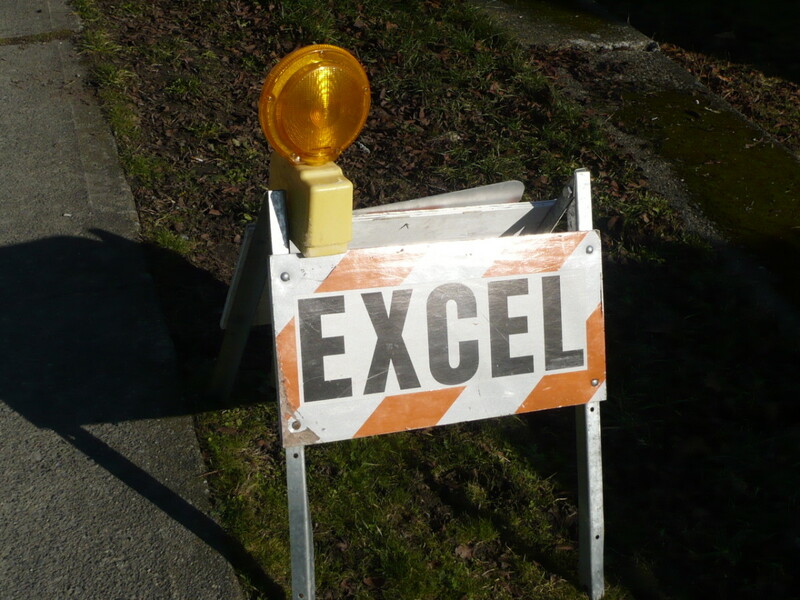 Forget that Excel is the name to a company and instead imagine it means "full speed ahead" in one aspect of your life. Perhaps you just went out on a first date and had a great time with the particular person. Seeing the sign could be just the nudge you need to ask her or him out for a second date. Perhaps the sign will keep you from nervously wondering, "Is this person right for me?" or "Is this relationship a healthy one?" You would have confidence that you are heading in the right direction as you saw the sign that blatantly told you to "excel" or move full speed ahead. In contrast to the Excel sign is the Stop sign. As a driver, you pull your vehicle to a gradual stop before the stop sign. You look left then right and over your shoulder to your blind spot. If safe to proceed, you then drive in a particular direction. Do you proceed the same way in real life? Sometimes when people have to make a difficult decision, they do not always stop and look at all of the possibilities before making a final decision. The expression "jump in, feet first" comes to mind. You go for it and throw yourself into the decision without giving an abundance of thought to the implications of the decision. The result can be magnificent but it can also be hurtful to your and to others. Perhaps the home business you started on a whim is now heading into bankruptcy as you did not plan to set aside enough savings. 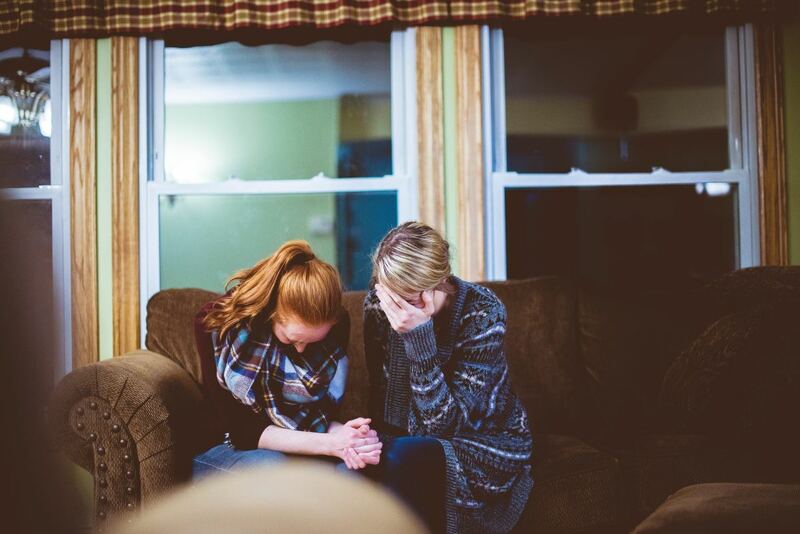 Now you and your family are facing financial hardships. 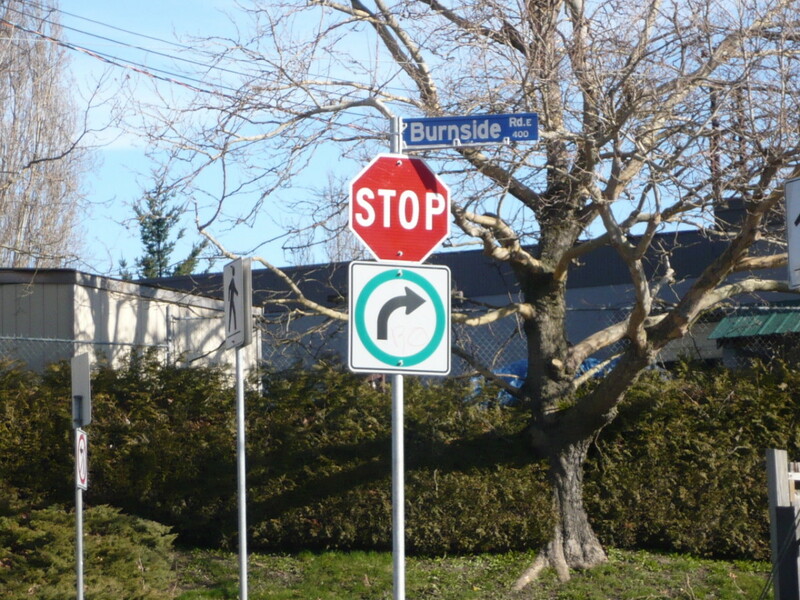 Perhaps the appearance of a stop sign could have been a bright red reminder to you that there are steps needed to prepare for starting a home business. A stop sign could certainly give you a wakeup call if you are heading down any type of destructive path in life! You could take a moment to stop, look around you, and get your feet positioned firmly back on the ground. When it is safe to proceed, you could then move in a different (and more positive) direction. While you may not get road signs in real life, you do get other "signs". Perhaps the day after you are laid off, you remember hearing a rumor that the company was downsizing. You realize you hadn't listened to the conversations but instead shook them off as being here-say. Sometimes there are signs in real life and you choose not to see them. Other times, you follow them immediately and never look back. Pay close attention to your day and see if any real life signs appear at the side of your road. Are you paying close attention and following the signs? Do You Wish There Were More Signs In Your Life To Help You Make Decisions? Mary, Thank-you for the reads and shares. Just keep watching for the signs! Mike, You are right that sometimes situations can be overwhelming. Thanks for the comment! Yep, Christy, there are many road blocks to make us all more careful and slow down in our speeding, you never can tell when a tole road awaits us ahead and may lead to our seeing our caution light, or when things can be slippery when wet by the rainfall in our storms of life.Nice work. Boy, I could use more road signs in my life to keep me on the straight and narrow! An interesting hub Christy.. But I really cannot decide if I need more or less signs! It depends I think, sometimes I wish there were more out there to make our lives easier but some other times I find them too many! Anyway, good job. Voted up and shared. Strong article! I think my sign is dead end. Hopefully, writing won't turn out that way. lol Great Job! @Rebecca, Looking back now I could have used signs as well! Or were there signs and we chose to look away? Thanks for taking time to read this one. Heheh the murals hub is farther back as I wrote it a while ago. No pressure to read, it is Beautiful Artwork: Victoria, BC Uses City Property as Paint Canvases. Take care hon! I couldn't find the murals Hub. This looked interesting! What a very good analogy comparing life's events to road signs. I sure could have done with plenty of caution and stop signs in my lifetime! Great job! @jennzie, signs could be clearer for sure LOL. Thanks jennzie! Nice hub idea! I definitely think signs would make it easier for me to make decisions. 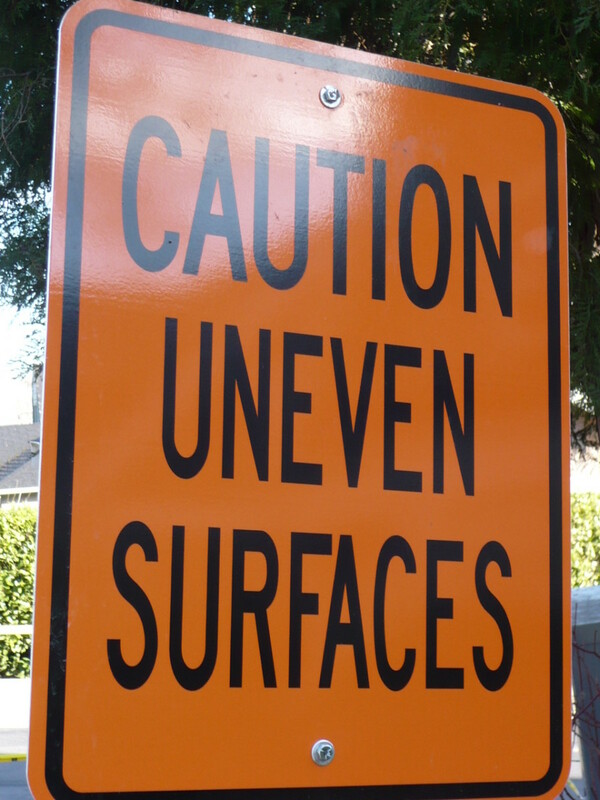 I like how you wove this article about actual warning road signs into how we behave in real life...either paying attention to the subtle signs that appear along life's path...or not. Often there are warning signs that (if and when we pay attention) can guide us safely through to the correct way of living our lives. I like how you think. Voted interesting and sharing. @Millionaire Tips, I think we all have signs that we prefer and sometimes need to step outside of our comfort zones. Thank-you for the compliment! You've very creative to compare the road signs to signs we get in life. I think I am pretty attune to the yield and stop signs in my life, but often I need the Excel sign - something that tells me it is all right to go full speed ahead. @lindacee, thanks for stopping by to read and comment. I'm glad you enjoyed the read! @Oscarlites, oh those signs! The bridge is cracked and old with holes in it could be another one hehe. @tillsontitan, thank-you for your great feedback here. Your praise for my hub gives me motivation to keep writing! How nice. @Jeannie, A manual would certainly be helpful! Love your signs/life analogies! A well-crafted Hub and a very enjoyable read. Voted up, useful and interesting. Thanks for sharing your insight! You took an every day object (signs) and turned it into a great hub. The way you related road signs to life signs was outstanding. So nicely done with such really good examples. This was innovative and interesting. Voted up, interesting and SHARING! I definitely wish there were more signs in life to help me determine the right thing to do. A nice owner's manual would be a good idea as well. Nice hub and voted up! @Vinaya, I do hope you are following the signs then! I want you to stay safe to write more great hubs :) Thank-you for your comment. @Tammy, Awe, thanks my friend! @Marc, Thanks buddy for all of your support as our writing adventures continue. You are helpful, selfless, and intriguing as well. I do hope you will write more hubs soon we miss you here! @Hubert, I do hope to help educate with my writing. Thank-you for the vote and the comment too. @Lord, you have great taste :) Hehe you are funny too! @billy, I am jealous of some us your hubs as well. There are plenty of topics to share my friend. Thanks for the great support! @rahul, I'm glad you enjoyed the thought behind the hub and the final product. Take care. @teaches, we all face challenges and how we react to these challenges vary.. I'm glad you enjoyed the read! @Lynn, You are a wise woman, way to go! I never thought of it this way before. Love it! This is cute and clever and so very true. Well done! Nepal is a mountainous country, if I don't remember the road signs, I could be in real danger. This is useful and informative hub. Way to go, Christy! See, I told 'ya to start bringing your camera for walks, and the hubs would flow... well done! I love the way you took everyday signs we take for granted and made them central to everyday life! Excellent and funny! I agree with Debby! Watch out Debbie! !That was close! I'm not sure that I pushed the submit button, but I voted you up and interesting. Maybe your hub will open some eyes and ears. This was a great topic Christy! I'm kind of jealous that you thought of it and I didn't. :) I'll get over the jealousy soon so no worries. Great job with some very good avenues of thought. Signs are good and have been used since the beginning of time. Great hub. I have learned to not ignore the signs. Ever. Christy! This is a very entertainingly insightful article. I have voted it up and I will definitely share it with my followers. Keep up your awesome writing. I enjoyed this topic as it had some very deep thoughts to it and challenges you to think about "What could be". We sometimes to get red flags along the way, but often we don't recognize them. Great hub and voted up. @Deborah, You are right that not everybody obeys the signs, whether they are on the road or elsewhere. Thank-you for stopping by to read, take care. signs are necessary.. I wish some people could actually obey the signs.